Not only for humans but also for the animals, the wearable technology market is growing rapidly. Trackers, collars, and other gadgets have been created which are wearable for animals and certainly help you in the care of animals. 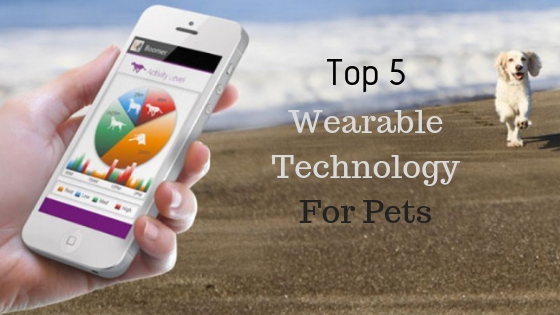 In this article, we have included only those wearable devices for pets which are popular all over the world. These wearable devices are most suitable for dogs, rabbits, cats, and even horses. Read the article in detail to know more. This device has become the most popular across the world in wearable technology for pets. It can be used for dogs, cats, and rabbits. It is like an indoor rabbit hutch. The best news for your pet is that it can monitor the overall health of your pet. PetPace is a lightweight and non-invasive wireless collar that your pet can easily wear for a long time. Your animal’s body temperature, activity, pulse, respiration, positions, calories consumed and burned, and even heart-rate variations all can be monitored by it. As you know, if your pet suffers from any type of health problem then he can not tell you about pain like humans. That’s why it informs you immediately by tracking the health status of the pet if any type of health disorder is detected. PetPace Smart Collar works with a Gateway that keeps you and your veterinarian up-to-date on your pet’s health. If you want to keep your pet healthy, Felcana is one of the best health monitoring devices which is wearable technology for pets. This wearable device can prove to be best choice because it is a health monitoring kit which gathers the health reports of your pet around the clock. This kit has been created with a connected collar. If your pet is feeling behavior or physical abnormalities it warns you immediately. The main feature of this wearable technology is that it can detect the early stage of dangerous diseases like diabetes, arthritis and provides feedback through veterinary advice. As a result, the health status of your pet can be improved before getting ill. According to the sources, more components are being added for the Felcana Kit so that your pet may get health care better. Wearable technology is working for animals besides humans. It is equally important for animals as it has proved to humans. When it comes to the animals, all types of wearable devices are available for dogs and cats. These devices can be easily worn around their collars. But there was nothing more for horses. There is no need to worry. Nowadays there are some devices are available for horses on the market from which we have included LED Tail Lights here. This light proves important for you and your horse when you have to ride during the night. This led light is hanged on the tail of the horse. Your horse may have to face an accident due to darkness during the night. But with the help of LED Tail Light, your horse can be protected from the accident because this light is visible from far away. When it comes to wearable technology for pets, FitBark has proved to be the most important wearable device for the healthy living and wellness of your pet. It is a very common thing for pet owners to be concerned about the health status of the pet. But if you are using the FitBark device then there is no need to worry about the health status of the pet. FitBark is a small, wireless and colorful device that is attached to the dog’s collar which monitors the overall health of your pet for 24/7. It monitors pet’s behavior too. Your pet’s activity levels, quality of sleep, distance traveled, and calories burned all are tracked by the FitBark. Not only this, the device plays a significant role in staying the pet owner healthy. Generally, there are more chances of your pet being obese but using Fitbark wearable technology definitely protects your pet from the dangerous health problem like obesity. That’s why FitBark is being used the most. Link AKC is the best wearable technology for your pet. it is a multi-use device. Because of the all-in-one solution, this device has become quite popular. We highly recommend that you should use this wearable device for your pet. It is helpful in tracking your dog. With the help of the device, you can set up a digital safe zone. If your pet leaves the zone, it will alert you immediately. This device tracks the ambient temperature also. When it detects that temperature is too cold or hot for your dog, it tells you. This wearable technology allows you to know which activities work for your pet as an exercise. There is a sound that helps to train the dog. Also, it comes with a LED light that protects your pet from being a victim of an accident during the night. After reading this article, it will be easy for you to know that how much wearable technology will prove to be important for your pet and these can be worn by your pet for a long time without any problem. If you want to provide a happy and healthy life to your pet, do not delay in using the wearable technology.